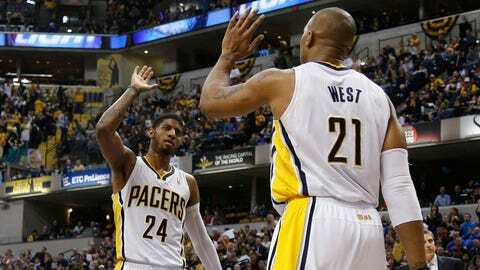 Jan 10, 2014; Indianapolis, IN, USA; Indiana Pacers forward Paul George (24) high fives forward David West (21) after the Pacers scored against the Washington Wizards at Bankers Life Fieldhouse. Indiana defeats Washington 93-66. 1. Indiana Pacers: Paul George’s 360-dunk vs. Clippers was eye-catching highlight of the year. And Pacers indeed continue to open eyes. 2. Portland Trail Blazers: Damian Lillard and LaMarcus Aldridge led way in first-half season of absolute fun. 3. Oklahoma City Thunder: Kevin Durant making life without Russell Westbrook a cinch. 4. San Antonio Spurs: With Gregg Popovich in charge, Spurs seem to win no matter who’s on the floor or who’s healthy. 5. Miami Heat: LeBron James and the gang haven’t looked as invincible lately and perhaps have put it in cruise control. 6. Los Angeles Clippers: Finding ways to survive without Chris Paul, but is it sustainable? 7. Golden State Warriors: Stephen Curry and pals still a smidge inconsistent, but when they’re good, they’re very good. 8. Houston Rockets: No way should a team with James Harden, Dwight Howard and others ever be limited to 19 points in a half. 9. Dallas Mavericks: Dirk Nowitzki, Shawn Marion and Vince Carter only show their age, like, once every six games. 10. Phoenix Suns: If Suns can maintain early-season success without injured Eric Bledsoe, Jeff Hornacek will be coach of year. 11. Memphis Grizzlies: Chemistry and defense are coming back, resulting in five straight wins entering Monday. 12. Atlanta Hawks: May not go out of their way to replace injured Al Horford and could still finish third in East. 13. Toronto Raptors: No one’s talking about Raptors giving away Kyle Lowry these days. 14. Denver Nuggets: Sure could use Danilo Gallinari, but no telling when he’ll return. 15. Washington Wizards: Every time you think John Wall and Co. are really onto something, they lose a bad one. 16. Chicago Bulls: A world without Derrick Rose and Luol Deng hasn’t been too terribly awful (so far). 17. Minnesota Timberwolves: A big trade to improve things and keep Kevin Love may soon become vital. 18. Brooklyn Nets: Starting to turn it around a little, Lawrence Frank report by Lawrence Frank report. 19. Charlotte Bobcats: For the first time in 190 games, Bobcats must adjust to playing without Kemba Walker. 20. Detroit Pistons: Every bit as maddening as previous teams that had Josh Smith or Brandon Jennings. 21. 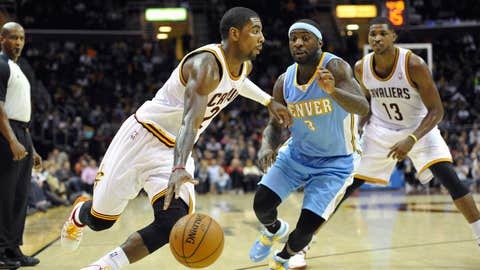 Cleveland Cavaliers: Won three of five games out West. Luol Deng making a difference. 22. Los Angeles Lakers: Play hard, but if Nick Young is most-discussed guy on your team, it’s time to start embracing the lottery. 23. New York Knicks: With J.R. Smith in the fold, it’s actually fairly amazing Knicks are this high. 24. New Orleans Pelicans: Tyreke Evans and Eric Gordon could be moved, and that may not be such a bad thing. 25. Sacramento Kings: Mike Malone should give Kings fans hope that this will get turned around soon. 26. Boston Celtics: Rajon Rondo is back, and Celtics have to be tempted by all the cool things they could get in a trade. 27. Utah Jazz: Well, having to play without Gordon Hayward for a while sure doesn’t help things. 28. Philadelphia 76ers: On the bright side, sounds like there’s a chance we might see Nerlens Noel this year, after all. 29. Orlando Magic: Aaron Afflalo may garner Magic another first-round pick and they’d be wise to explore it. 30. Milwaukee Bucks: If Bucks don’t move Larry Sanders by deadline, it’ll be a bit of a surprise.